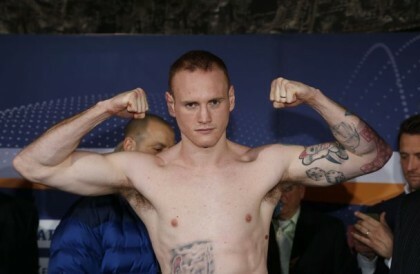 Super-middleweight boxer George Groves says his third world title quest will end in success, as he prepares to take on European champion Christopher Rebrasse next month. The 26-year-old faces the Frenchman, who is ranked third with the World Boxing Council, on September 20 at the SSE Arena in Wembley. The winner takes the European title and the opportunity of a final eliminator for the WBC Super Middleweight belt, which is currently held by Sakio Bika. Bika first fights in a title rematch against American Anthony Dirrell, but Groves said neither fighter would be able to halt his world title chase. Groves blogged exclusively on Sportlobster.com: “I am back on the hunt for success and, in turn, will deliver a successful bid in a world title quest. “The route chosen is a fantastic one, in my opinion. The opportunity is a challenge at the European title and, more importantly, a final eliminator for the WBC belt. “It is currently held by the ever so exciting/unexciting Sakio Bika, who is scheduled to defend against the equally enthralling Anthony Dirrell. “I managed to share the 5th Street gym ring with Dirrell, before the fight with James DeGale, on a training camp out in Miami. “He is a cool dude and a nice guy. I don’t know much about Sakio, but he seems cool too. Groves twice challenged Carl Froch for the IBF and WBA Super Middleweight titles, but was defeated in both fights against the 37-year-old. The Hammersmith-born fighter suffered a knockout in the eighth round of their rematch, which was held at Wembley Stadium and yesterday declared as the biggest grossing fight ever in Britain. Despite the loss in front of 80,000 fans, Groves insists he is more than able to exorcise any demons when he returns to Wembley. He added: “I have the winning streak of Biggie on the Herbalife diet. This will change, however. “It must change and much like the changing seasons or giraffes fighting the urge to be gay, change is good. “Wembley Arena has been a successful stomping ground in the past and I aim to continue this trend. “Returning to Wembley could well be a tough challenge in itself. It could pose mental scars, like it would for Tulisa queuing at a hotdog stand. “However, I know this won’t be the case for me. I will relish the excitement of simulated emotions. It is when you most feel alive. “In front of 80,000 people, I had the time of my life. Standing, parading and revelling in the atmosphere was one of my favourite and proudest moments. Sportlobster is the sports social network bringing news, predictions, blogs, photos, videos and event scheduling into one online platform, customised to each fan’s preferences.